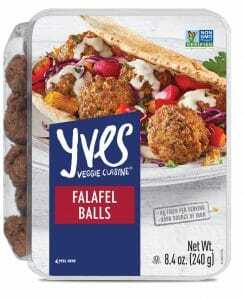 NEW HYDE PARK, N.Y.– Yves Veggie Cuisine, with its full line of veggie-forward appetizer bites, burgers, dogs and deli slices, is debuting a whole new look on grocery store shelves in March. The new packaging aims to help call attention to the fresh veggie-forward ingredients that Yves has always been known for, while also bringing forward different usage occasions to help inspire consumers. With these fresh updates, the brand aims to continue meeting consumer appetites with their delicious veggie-forward products, while continuing to stay competitive and stand out at shelf. With this brand refresh comes a brand-new campaign. Yves Veggie Cuisine recently conducted a consumer survey to uncover who would be more willing to change their eating habits, or even cheat on meat, in the name of love. The answers will surprise you. If your New Year’s resolution is to eat better, you better make sure your partner is on board. Some men are so picky when it comes to food that one in five (20 percent) have ended a relationship over dietary differences, compared to just 11 percent of women who have done the same. The rise of foodie culture has also led younger generations to prioritize cuisine, even over relationships at times. Nearly one out of three millennials (29 percent) and almost a quarter (23 percent) of Gen Xers have ended a relationship over dietary differences, compared to just one percent of Boomers. Though men are often stereotyped as carnivorous cavemen, the majority are willing to cheat on meat in the name of love and trade in those porterhouses for a veggie burger to make their partner happy. Nearly two-thirds of men (63 percent) are likely to eat less meat if their partner asked them to, and nearly as many women (62 percent) would do the same. Yves Veggie Cuisine aims to help ease the tension of being in an inter-culinary relationship with their full line of delicious veggie-forward food options. Visit yvesveggie.com to learn more or connect via social media on Facebook (@YvesVeggiePage) and Instagram (@YvesVeggieCuisine).